This is a simple game that you can use to practice yes/no questions and answers in the third person singular for the language function “talking about likes and dislikes.” Of course, you can easily modify the game to suit other grammar points and language functions. Like all successful game that I have used when teaching ESL, this one adheres to three simple principles: 1. The rules of the game are simple and easy to explain to students ( I have seen many a game or activity die a quick death because it was too complicated and the language necessary to explain the rules were beyond the language skills of the students. ), 2. It results in students practicing the grammar point and language function in question, and 3. It's fun. All you need for this game are some sheets of paper, a white board, and a white board marker. Before playing this game, you should have taught your students the vocabulary and grammar necessary for talking about likes and dislikes. You will have explained to your students the difference between things (“Do you like books? ), and activities (“Do you like reading?”). Does Pook like playing football? This game works best with 12 to 20 students. Separate the class into two teams. On the white board, write down approximately 15 different activities. 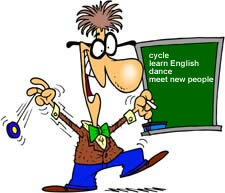 Example: play football, study English, cycle, etc. Write down a good mixture of activities that reflect ones that not all people would definitely like or dislike. Write verbs in the present simple form so that the students must conjugate them for the game. Tell students to write all the activities on a sheet of paper, and next to each activity to write “Yes” or “No”: an indication of whether or not they like the activity. Tell the students to write their names on their pieces of paper. Collect the sheets of paper from the students. Make sure that you keep the papers in separate piles to reflect the teams. On the white board, write the team names with space underneath for marking points. Also, you should keep all the activities on the board that you wrote down earlier. One student from the first team must ask another student from the same team about a student on the other team. Student A on team 1: Does Bink [Bink is on team 2] like playing tennis? Student B on team 1: (ponders for a moment, looks at Bink, and probably giggles) No, she doesn’t. You check the paper on which Bink wrote her answers earlier and tell the class the verdict. If team A was correct, they get one point. If they were wrong, they get an X (or no points, or the other team gets a point; whichever you prefer). Alternate between teams with each student having a chance to ask and answer the questions. Simple game but you will have the students laughing within minutes and they will be unselfconsciously speaking English and hopefully retaining some of the question and answer forms and related vocabulary. This is an original game. However, it is so basic that I have no doubt that others have created very similar versions. Thank you very much for your tip! I did it yesterday with my students (adults) and even if we hadn't much time, they did enjoy it!